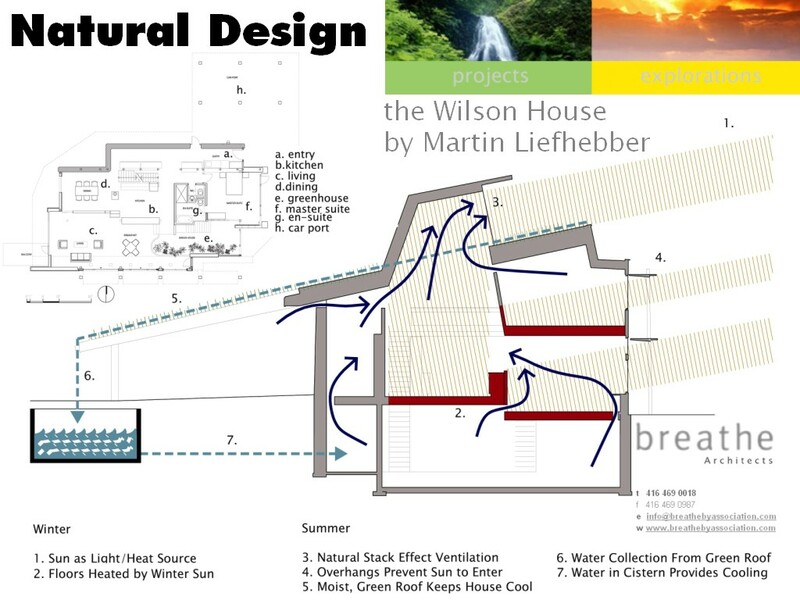 The design and build process for the Wilson Solar house. We spent several months reviewing ideas, our desires, theories on how to use the natural material present at the site, how to extend the seasons using shielding on the south side and much more. July 1999 - Natural design techniques. Sensible for winter and summer. Design by Martin Liefhebber, architect - www.martinliefhebber.com . The National Post Design Exchange Awards competition is Canada's only awards program to judge design by results; balancing function, aesthetics and economic success. Once the foundation was completed the walls were insulated and then we put up the steel beams that will hold up the centre of the house. 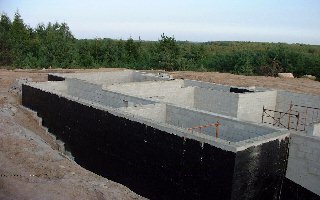 The foundation has been built with local concrete blocks. The black coating will provides water proofing. August 31, 2000 - The foundation is in! 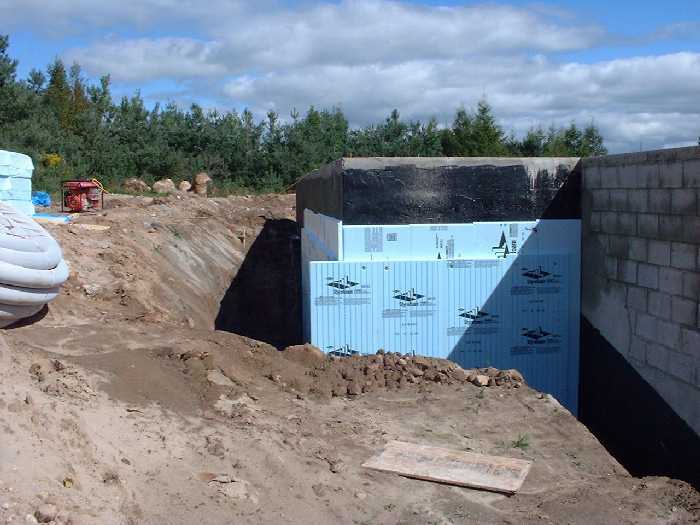 September 2000 - Exterior and some interior foundation walls get nearly four inches of foam insulation. 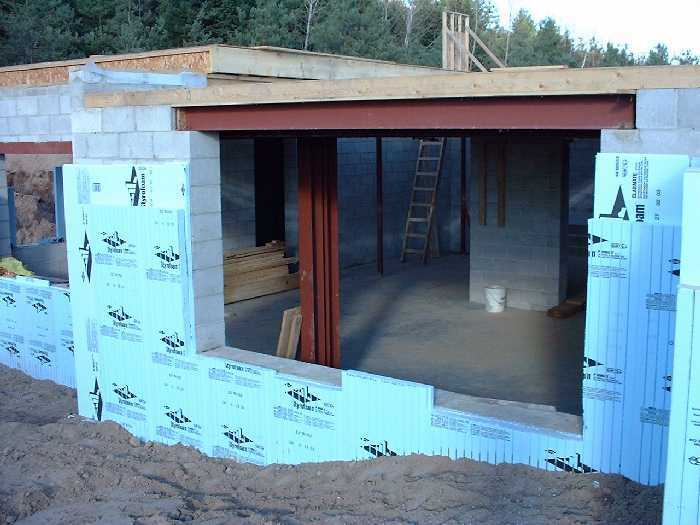 Putting this on the outside removes the potential for condensation on the inside walls, not to mention improving the insulation levels substantially. September 2000 - The steel beams hold up the heavy concrete floor as well as the vegetative roof that will eventually rest on these posts. Colin gets expert help from the Wilson family as the critical height for the ground floor is determined. 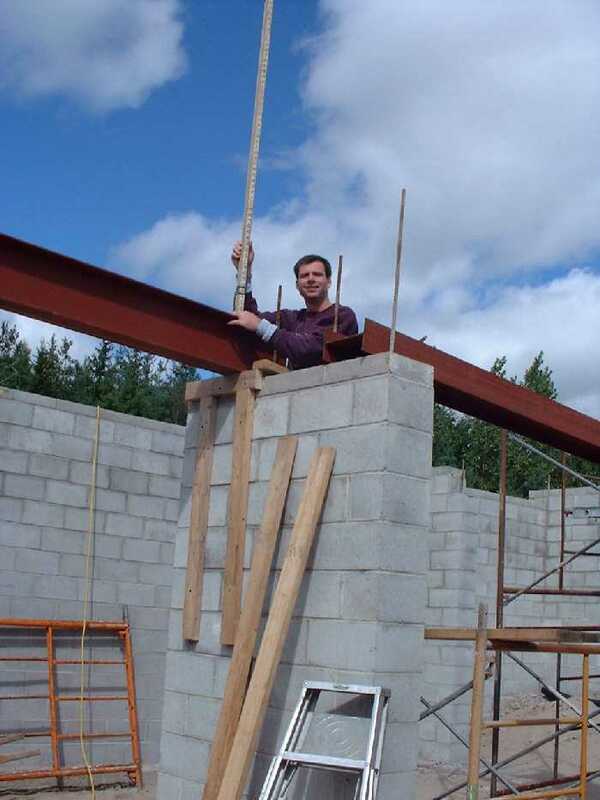 September 2000 - Colin has carefully prepared to get the beams perfectly level. 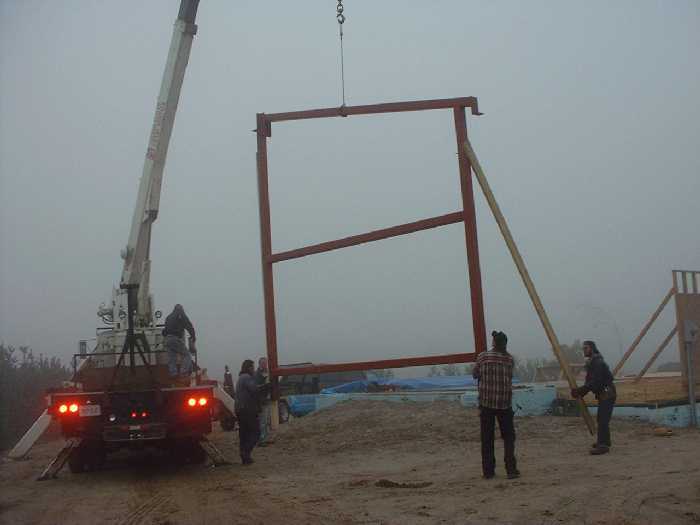 September 2000 - Using a transit we make sure that the beam is at the correct relative height. 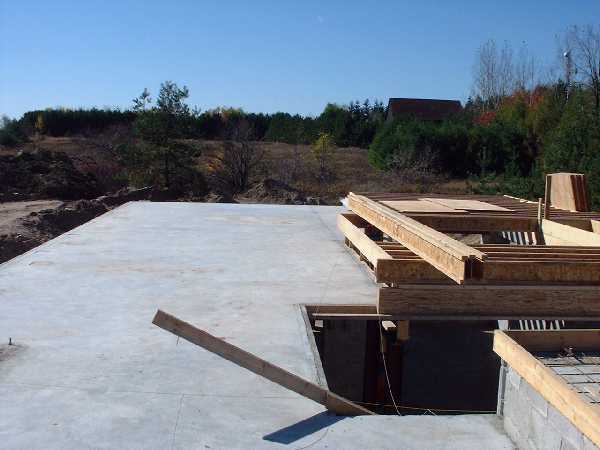 The foundation is done and we start the process of embedding the floors with mass to collect solar heat passively. 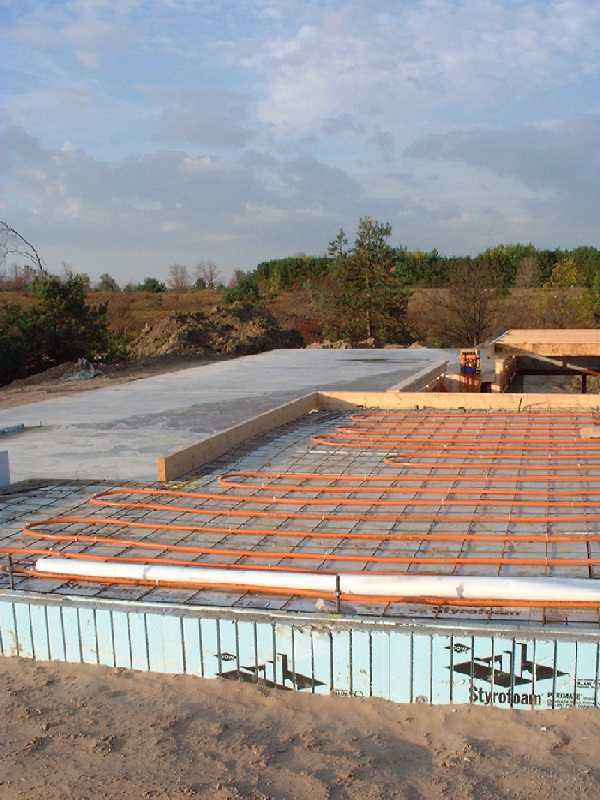 After this stage water tubing will be tied into the floor just before the concrete is poured. 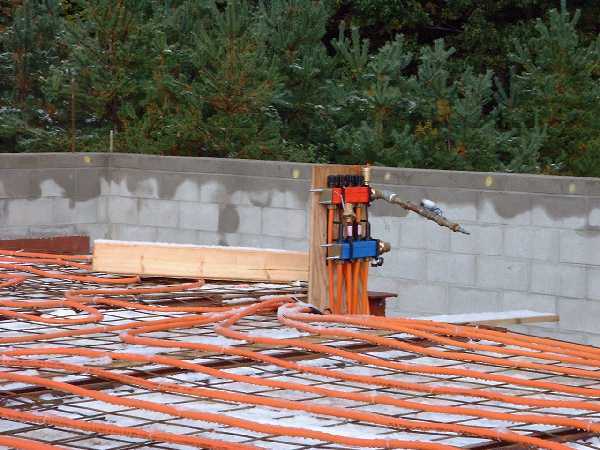 This is the basis for the in-floor heating/cooling system used throughout the house. 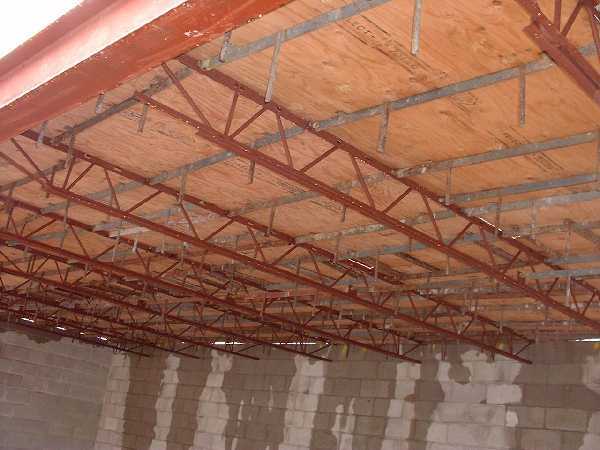 October 4 2000 - The joists are ready in the basement. Tyvek was added after this picture was taken to create a smooth ceiling finish. 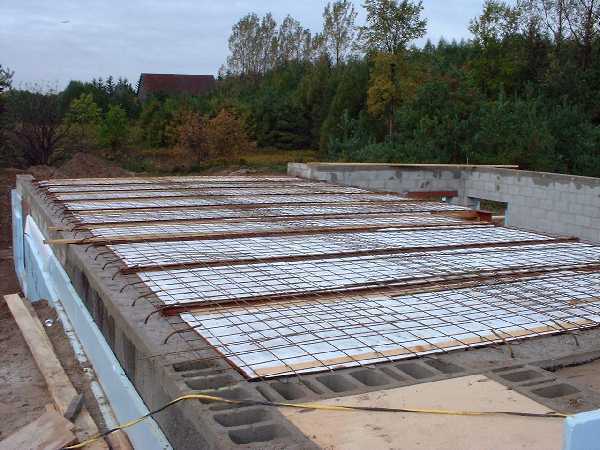 October 4 , 2000 - The basement floor is ready to have steel lattice and then the water pipes laid out for in floor heating. 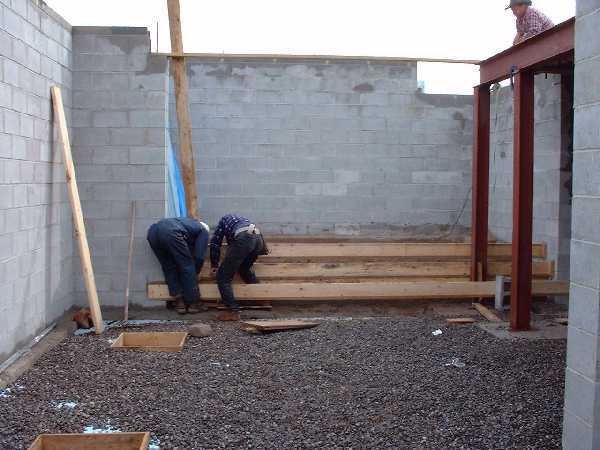 Steps are formed for easy access to the central composting toil system area. 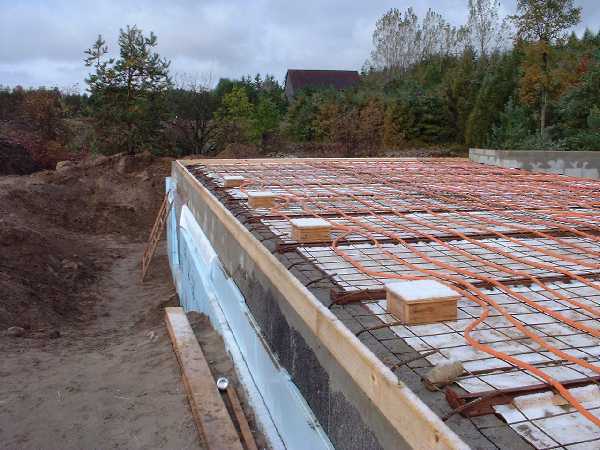 October 4 2000 - The ground floor is ready for the in-floor heating/cooling system to be installed. October 4, 2000 - Looking west down into basement. The doorway on the far right leads to the future "cold room" where we will store food that needs to be kept cold. 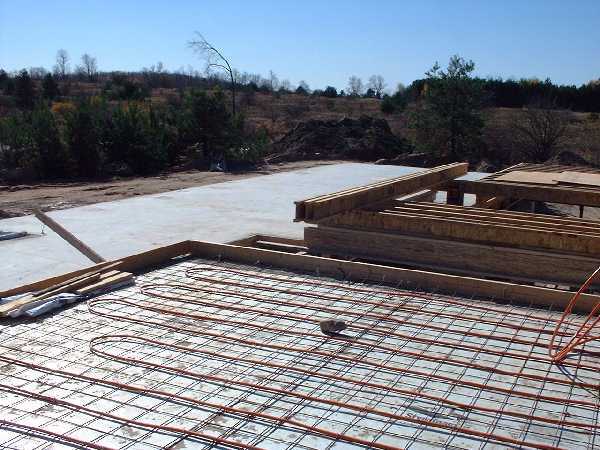 Extensive tubing is tied to the steel wire grid that reinforces the floor. This will provide both our heat collection and distribution. It can also provide cooling during the summer. October 8 2000 - The master bedroom in the foreground with the living room in the background looking south west over the property. October 8 , 2000 - The ground floor on the south side. A major collection area for passive solar heat. 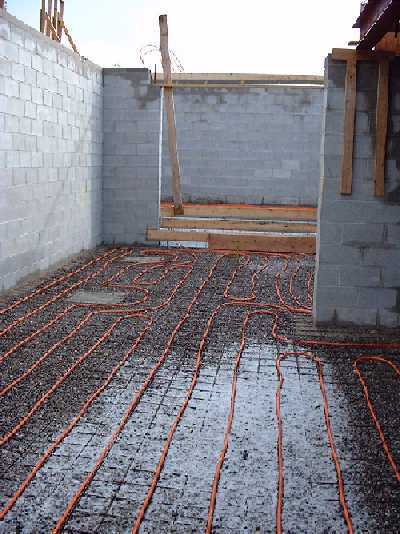 October 8 2000 - The ground floor heating tubing comes together at a distribution point. October 4, 2000 - Looking west down into basement. The square wooden boxes will provide the forming for the tempered glass windows which will be placed in the concrete floor. This brilliant design idea that Martin suggested will provide excellent lighting for the basement as well as adding interest to the ground floor living room. 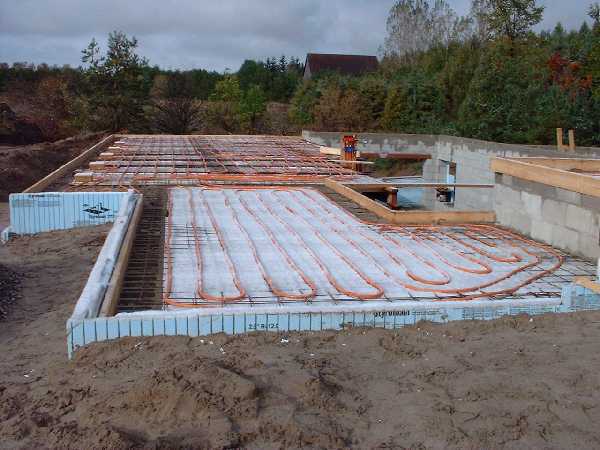 October 8, 2000 - The basement gets extensive tubing for in floor heating. 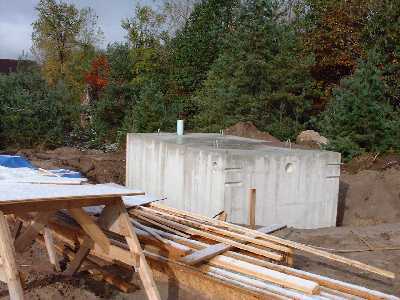 October 8, 2000 - The water cistern which will hold our rain water collected from the vegetative roof. October 16 2000 - The master bedroom looking south west into the living room (left) and kitchen (right). Here the concrete has been poured in the living room to the south while the master bedroom in the foreground awaits completion. October 16 , 2000 - The ground floor on the east side looking west. The in-floor heating system has been covered in concrete and smooth floor remains as the final surface. 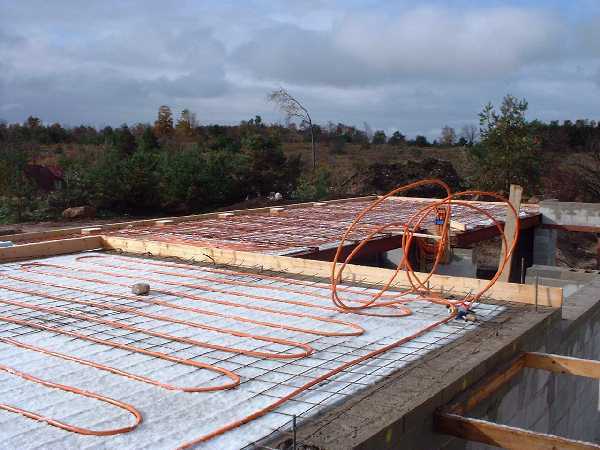 October 16 2000 - The ground floor heating tubing comes together at a distribution point. 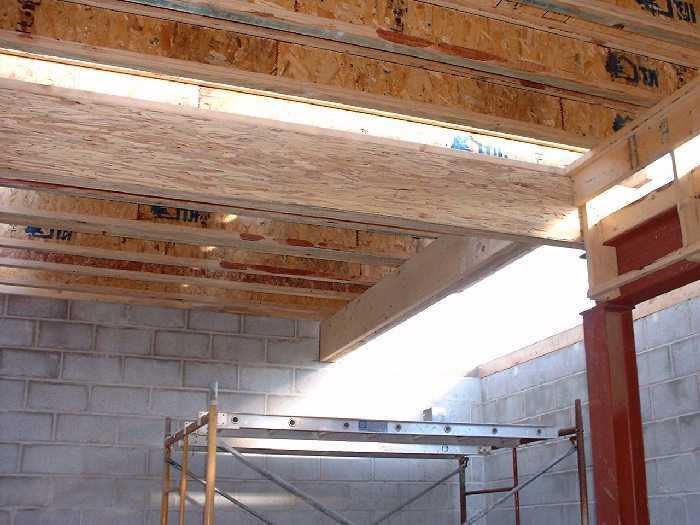 The ground floor joists are in and the basement takes shape. Exentsive use of natural light is provided by windows and openings into the basement. November 5, 2000 - The ground floor on the south side is in. Martin has suggested we leave the opening through to the basement so that we get lots of natural light. Looks good at this stage. November 5, 2000 - Stairway down from the green house on the south side into the basement. Eventually this will be the way we empty the central composting toilet system that will sit here. November 5, 2000 - Walk out on the west side with lots of windows to capture the setting sun. Heavy duty steel is being used to brace the house for strong winds and a heavy vegetative roof. 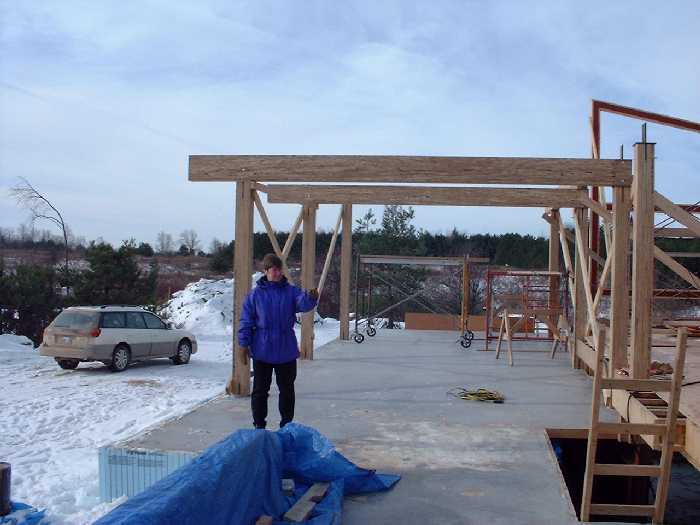 Straw bales will fill in the post and beam construction along the north portions of the house. 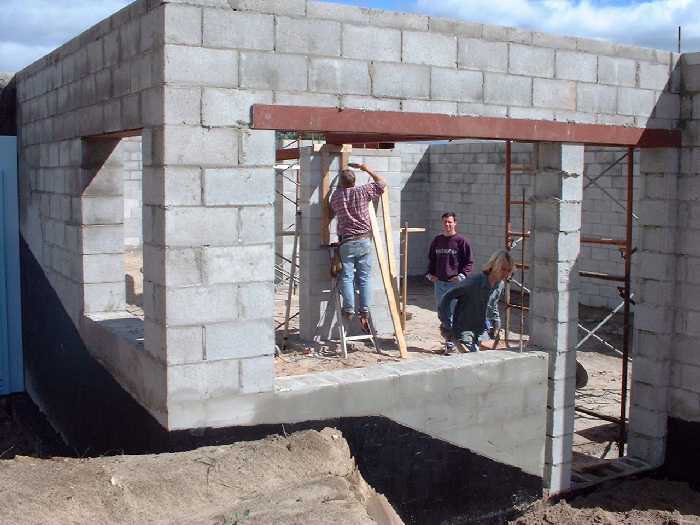 November 13, 2000 - Framing around the master bedroom on the east side with steel. This was a cold and foggy morning. 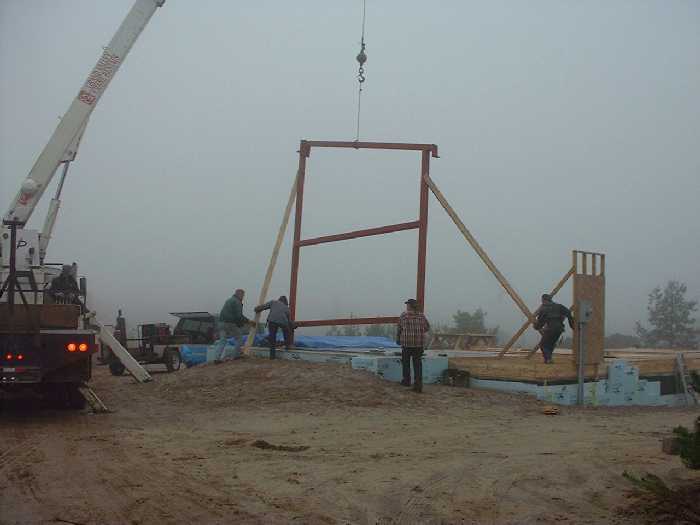 November 13 , 2000 - Positioning the frame and fastening to the foundation. 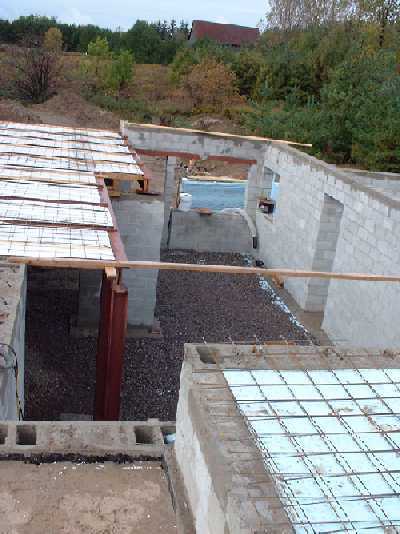 November 13, 2000 - Steel framing for the west side of the house. 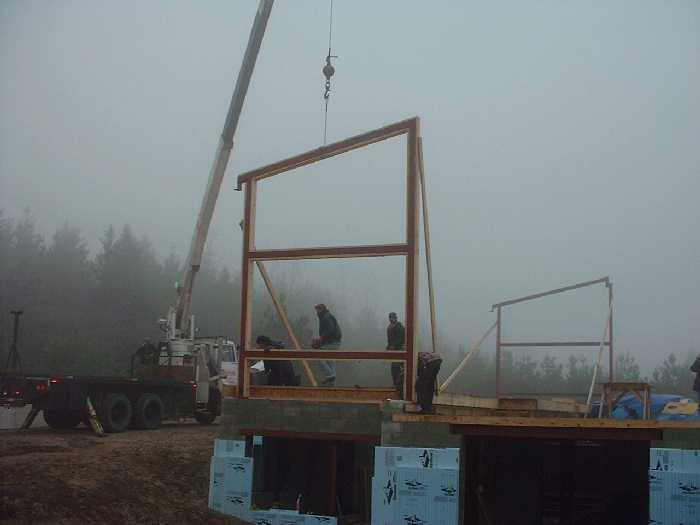 November 13 , 2000 - Looking east as the west frame is positioned. The east frame is in position and ready for post and beam construction. 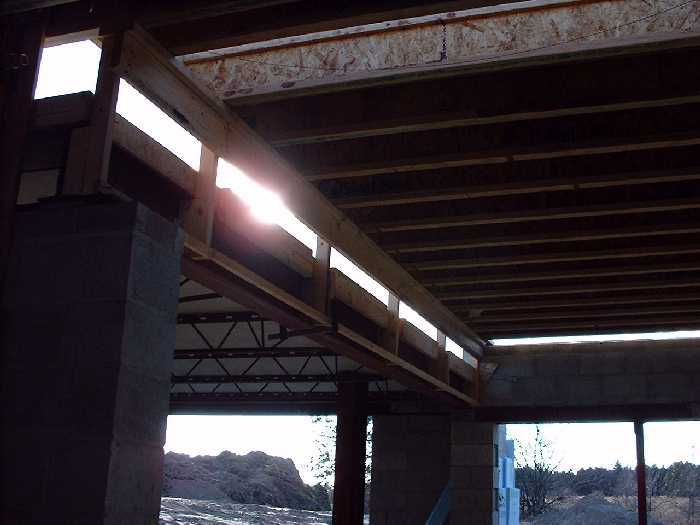 Heavy duty steel is being used to brace the house for strong winds and a heavy vegetative roof. 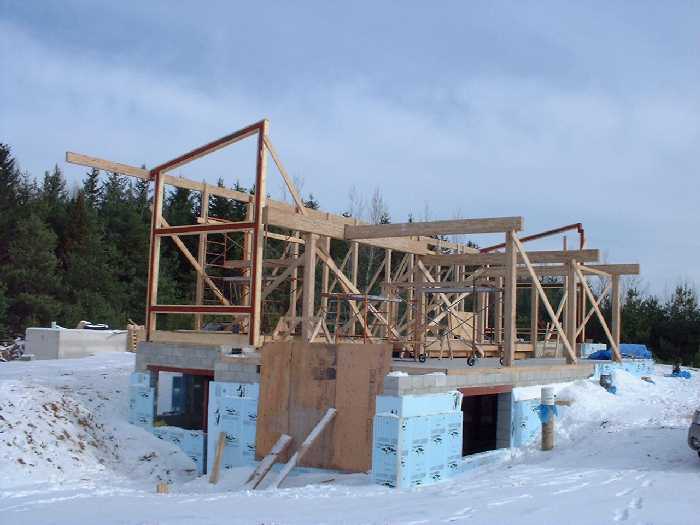 Straw bales will fill in the post and beam construction along the north portions of the house as insulation with stucco finishing. 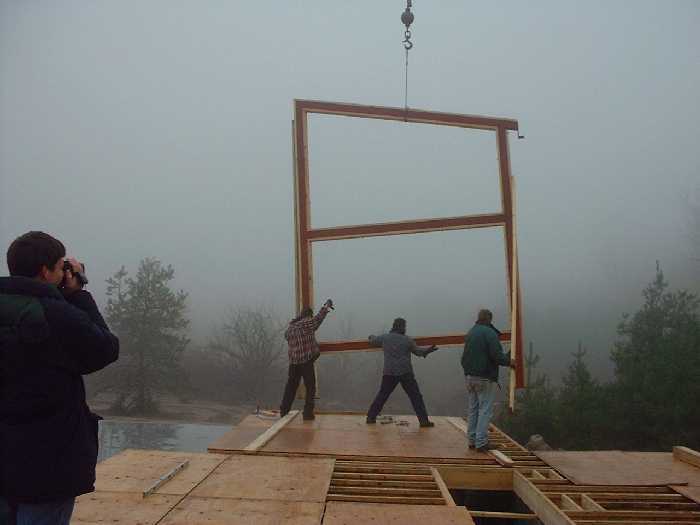 November 25, 2000 - Framing for the the living room on the ground floor. 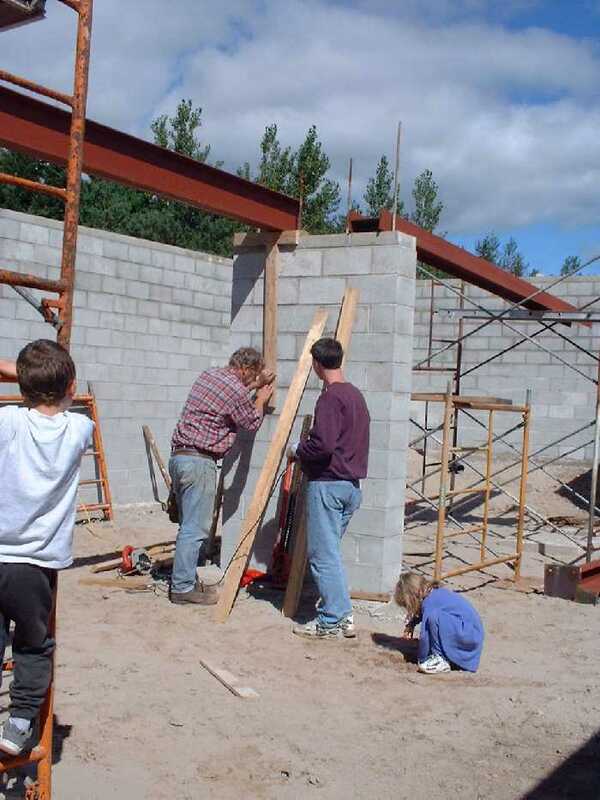 November 25, 2000 - Reviewing the construction. From left to right, Colin, Hal and John. November 25, 2000 - A view of the framing looking north west. 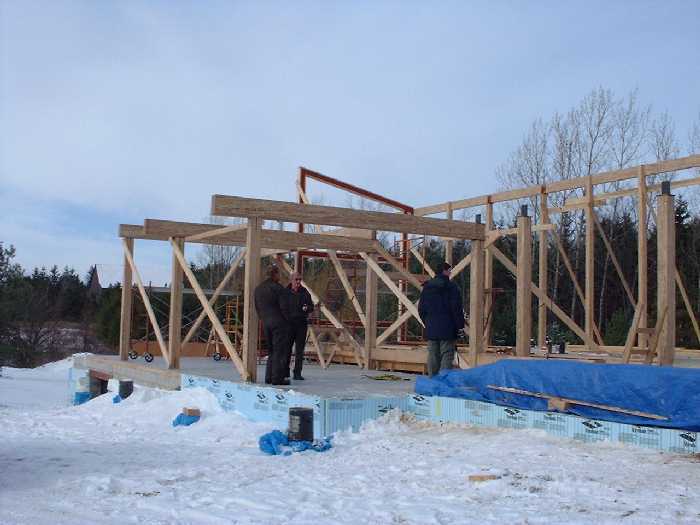 November 25, 2000 - Looking at the newly framed ground floor from the south west looking north east. 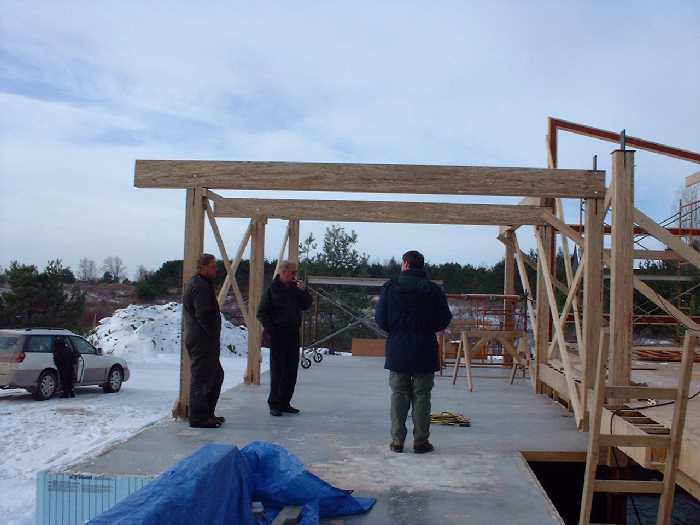 The beams are mainly Glulam constructed beams made from fast growing trees. 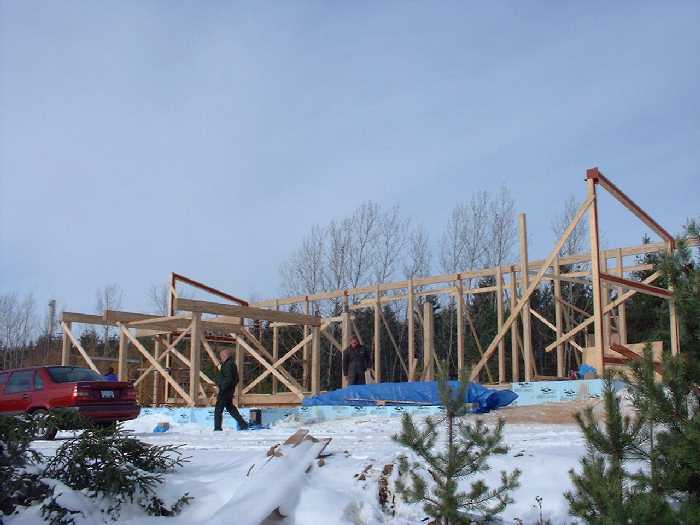 November 25, 2000 - From a distance the framing takes shape.